What are the functions of endotracheal tubes ? provides a passage for gases to flow between a patients lungs and an anaesthesia breathing system . allows one to provide positive pressure ventilation. protects the lung from contamination from gastric contents and nasopharyngeal matter such as blood. It is a commonly used device that is critical for patient safety so it is important that you understand its design and use. Endotracheal tubes come in various sizes and shapes, but the basic concepts underlying them is the same for all. A tracheal tube, as the name suggests, is a tube ! What are tracheal tubes made out of ? Most endotracheal tubes that you will encounter will be made out of plastic (Polyvinyl Chloride, PVC). These may be visually clear or opaque. Plastic is not radio opaque and therefore plastic tubes have a line of radio opaque material that makes them more visible on a chest X Ray. Endotracheal tubes have an inner diameter and an outer diameter. The “size” of an endotracheal tube refers to its internal diameter. Therefore if you ask for a “size 6” endotracheal tube, you are asking for one with an internal diameter of 6 mm. The image below shows a size 6 mm endotracheal tube. In this particular endotracheal tube, the internal diameter is labelled as “ID 6.0” and similarly, the outside diameter is labelled as 8.8 OD. Narrower tubes increase the resistance to gas flow. A size 4 mm endotracheal tube has sixteen times more resistance to gas flow than a size 8 mm endotracheal tube. This can be especially relevant in the spontaneously breathing patient who will have to work harder to overcome the increased resistance. Thus one should choose the largest diameter endotracheal tube that is suitable for a given patient. Paediatric endotracheal tubes have a much smaller internal diameter. The length of an endotracheal tube is measured from the end that goes into the trachea and is marked in centimeters. After intubation, you should note the “length marking” of the endotracheal tube with reference to a landmark such as incisor teeth or lips. This will help you to monitor the endotracheal tube position and detect if it has moved outwards or further down into a bronchus. An endotracheal tube that is too long for a given patient may be more prone to kinking and become obstructed. It can be cut to a more appropriate length if necessary. Below is a photo of probably the longest endotracheal tube in the world ! The gentleman is Bob, of Mallard Medical Incorporated, a company that supplies equipment used to anaesthetise large animals. In the image below, he is holding an endotracheal tube used to ventilate elephants. This particular tube has an internal diameter of 45 mm ! You can imagine the length of the tube as Bob is six feet (183 centimeters) tall ! To help correct depth of placement, some endotracheal tubes have black markings proximal to the cuff . As shown below, in endotracheal tubes with only one mark, the vocal cords should be at this mark. The endotracheal tube shown below has two marks. In this type, keep the vocal cords between the two marks. However, these marking systems only provide a rough estimate and correct endotracheal tube position depth should always be confirmed by auscultation. 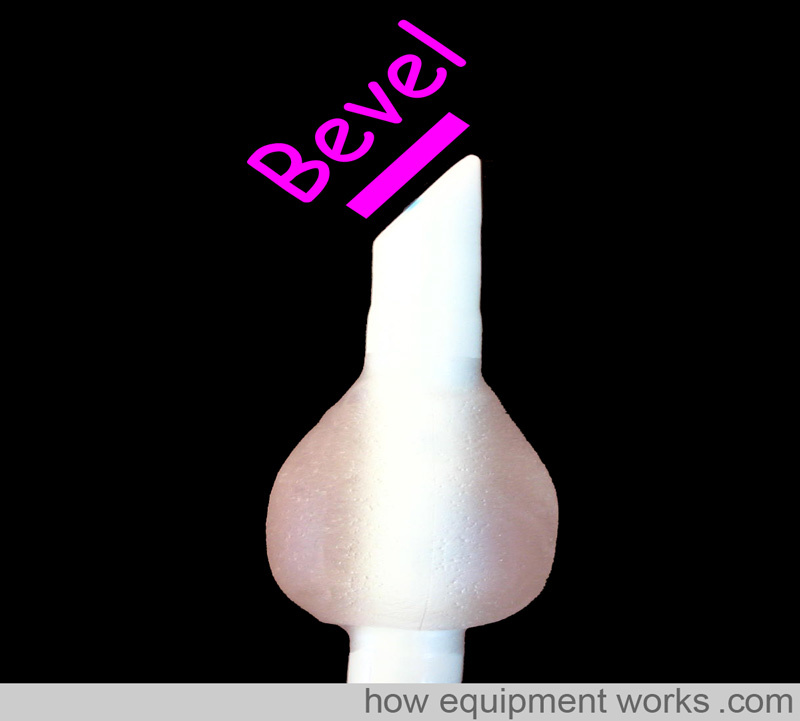 To make it easier to pass through the vocal cords and to give you a better vision ahead of the tip, endotracheal tubes have a “slant ” called a bevel . As the endotracheal tube is advanced near the cords, the left facing bevel gives a better view . Some endotracheal tubes have an additional hole at the tip called a Murphy’s Eye . If the main opening of the endotracheal tube gets blocked by for example abutting against the tracheal wall (represented in the image by my finger) gas flow can still occur via the Murphy Eye. Without the Murphy Eye , the endotracheal tube would have been completely obstructed . A cuff is an inflatable region at the patient end of an endotracheal tube. Endotracheal tubes may or may not have a cuff. In the image below , endotracheal tube 1 does not have a cuff. The endotracheal tube 2 has a cuff that is deflated, and endotracheal tube 3 has a inflated cuff. The inflated portion forms a seal against the tracheal wall. This seal prevents gases from leaking past the cuff and allows positive pressure ventilation. The seal also prevents matter such as regurgitated gastric contents going into the trachea. After intubation, the cuff is inflated with air. As shown in the image below, this is done by attaching a syringe to the pilot balloon . The pilot balloon is connected to the cuff by a thin tube. As the syringe supplies pressurised air, the pilot balloon and cuff inflate. Once the cuff is inflated the syringe is removed. Air does not leak out as there is a one way valve at the pilot balloon. By feeling the pilot balloon, one can estimate the amount of pressure in the cuff. If the cuff is leaking, e.g. due to damage by the surgeon during a thyroidectomy, the pilot balloon will collapse. Cuffs are designed to have either an high volume or a low volume. As explained below, cuffs with a high volume have a low pressure and are called “High volume Low pressure” cuffs. Similarly, cuffs with a low volume have a high pressure and are called “Low volume High pressure” cuffs. High volume low pressure cuffs: As shown in the image below, because of their large volume, they have a larger surface area in contact with the trachea. This means that they apply a lower pressure against the tracheal wall and have a lower incidence of tracheal wall ischemia and necrosis. The seal is not as good as the seal in high pressure cuffs because of the lower pressures and because the large cuff may develop wrinkles that allow material to pass by the cuff. Low volume high pressure cuffs: These cuffs have a lower volume and the surface area in contact with the trachea is small. This results in a high pressure seal that is more effective than the one caused by high volume low pressure cuffs. However, this high pressure is more likely to cause tracheal ischaemia and necrosis if used for a prolonged period of time. Endotracheal tube connectors connect the endotracheal tube to the breathing system. One end of the connector connects to the endotracheal tube and this end has a diameter that depends on the endotracheal tube size (see small arrows in image below). The other end connects to the breathing system and has a 15 mm outer diameter (British Standard). Endotracheal tubes are often not directly connected to breathing systems. 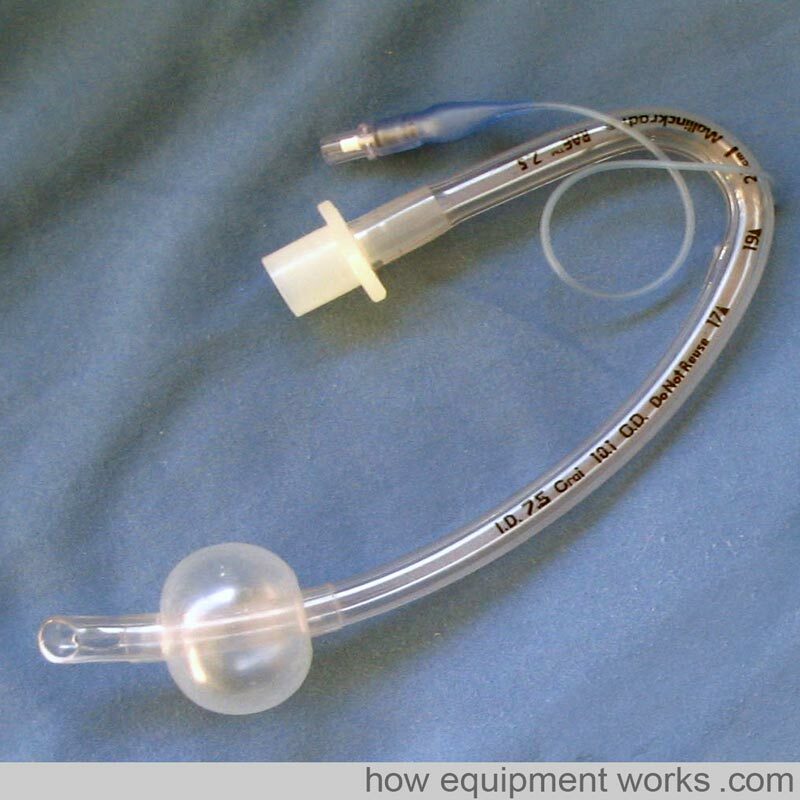 Instead , to provide a more flexible connection, endotracheal tubes are often connected to a flexible “Catheter Mount “ (see image below). The catheter mount is then connected to the breathing system. Preformed endotracheal tubes are moulded into special shapes that permit good surgical access in the oro nasal area. For an example (refer to picture below), a “South “ facing preformed endotracheal tube provides good access for the ENT surgeon needing to work in the nasal passages. Similarly, a “North “ facing (i.e. the tube emerges from the patient and faces towards the patients top) preformed endotracheal tube provides very good access to the mouth for dental work . The pre formed endotracheal below has a special name. It is called a “RAE” tube, named after its inventors Ring, Adair, and Elwyn. Endotracheal tubes for paediatric patients are smaller than those meant for adults. Because the paediatric trachea is susceptible to damage by pressure, most paediatric endotracheal tubes are uncuffed. However, cuffed versions similar to adult endotracheal tubes exist and when used, must be inflated with care. A wide range of sizes are available. Formulae are available to guide size selection. After intubation, depending if the fit is too tight or loose, one may have to use a different sized endotracheal tube. For this reason, one should always keep a wide range of paediatric endotracheal tube sizes. The endotracheal tubes may have a mark to guide optimum depth of placement. In these endotracheal tubes, the vocal cords should be at the junction (see red arrow) between the black area and clear area as shown below. 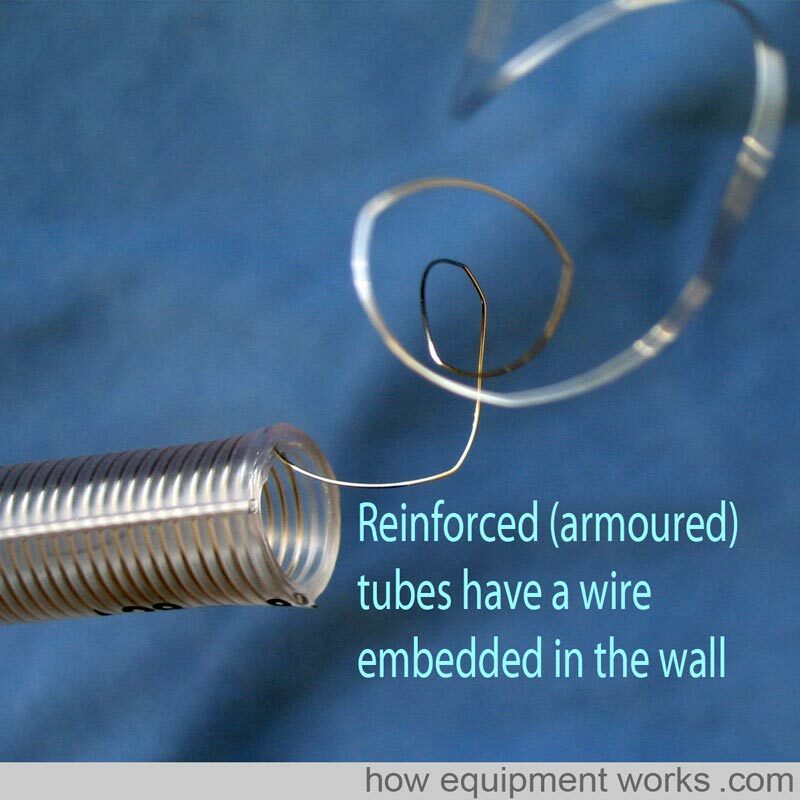 Reinforced or armoured endotracheal tubes are specially designed to be resistant to kinking. As shown below, they achieve this property by having a spiral of wire embedded into the wall of the endotracheal tube to give it strength and flexibility at the same time. These are particularly useful for head and neck surgery where the endotracheal tube may be sharply bent and also compressed by the surgeons. Armoured endotracheal tubes can be easily bent away from the area of surgery and thus improve surgical access. Some airway surgery involves the use of laser beams to burn away tissue. These beams can ignite ordinary endotracheal tubes and in the presence of Oxygen may cause major airway fires. Special endotracheal tubes are available (example shown below) which resist damage by laser beams. In the endotracheal tube shown, there is a laser resistant metal foil wrapped around it for protection. The cuff of laser resistant endotracheal tubes are usually filled with saline instead of air to minimise the risk of fire. The saline may be coloured blue using methylene blue dye. As will be shown to you in the next picture, this helps to detect cuff rupture due to fire. If the laser manages to damage the cuff, the colouring will help identify rupture and the saline will help prevent an airway fire. In thoracic surgery, there are times that you may need to isolate and selectively not ventilate one lung. For an example, during an oesophagectomy , one may choose to not ventilate one lung to provide better surgical access to the oesophagus. There are special endotracheal tubes called “double lumen tubes “ to achieve this. A double lumen tube can be thought of as two endotracheal tubes joined together (see graphic below). One tube is shorter and ends in the trachea and there is cuff at this level called the tracheal cuff (colored red in the image). The other tube extends further and enters a main bronchus and has its own cuff (bronchial cuff, usually coloured blue). Using a special connector and clamp, one can avoid ventilating one lung and let it collapse to provide good surgical access. Here are some close up images of actual double lumen tubes. The image shows a left sided double lumen tube. The bronchial end (blue cuff) is inside the left bronchus. An alternative to using a double lumen tube to isolate one lung is to use a standard endotracheal tube along with a special device called a “bronchial blocker”. The bronchial blocker has a thin tube with a cuff at one end. Let us isolate the left lung using a bronchial blocker. First the trachea is intubated with a standard endotracheal tube. As expected, you will be now ventilating the left lung and the right lung. The bronchial blocker is inserted through the standard endotracheal tube you just inserted. It is guided into the left lung, often using a fiber optic scope. Once positioned correctly, the cuff of the bronchial blocker is inflated. This cuff blocks air entry into the left lung. The air in the left lung escapes through the thin bronchial blocker tube (shown in pink ) making the left lung collapse. Ventilation to the right lung continues through the standard endotracheal tube (shown in green). After the surgery, if you want to continue to ventilate the patient, the bronchial blocker is pulled out, leaving behind the standard endotracheal tube to ventilate both lungs. There are various advantages and disadvantages of double lumen tubes and bronchial blockers. 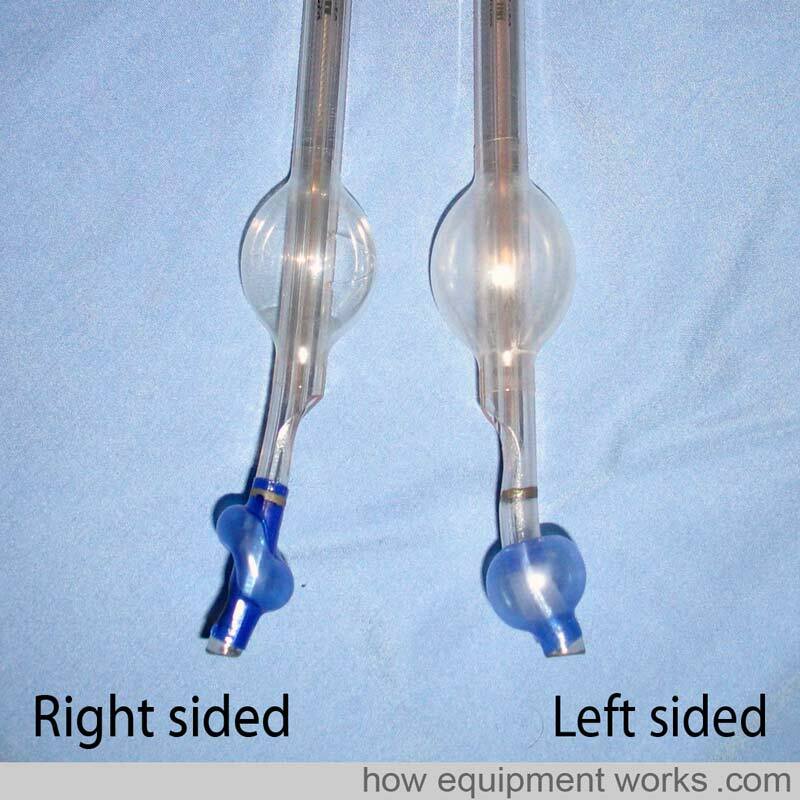 Both lumens of a double lumen tube are wide so you can individually suction both lungs. On the other hand, the lumen of bronchial blockers are generally too small for effective suction, so secretion removal from the blocked lung can be difficult. Double lumen tubes are bulky and are therefore difficult to insert in a difficult airway. On the other hand, bronchial blockers need only a standard size endotracheal tube so are easier to insert in this situation. Due to their size, double lumen tubes are also more traumatic and are usually not used postoperatively for continued ventilation. Bronchial blockers need only a standard endotracheal tubes which are much less traumatic and can be easily kept in for postoperative ventilation. In anaesthesia we often talk about sharing the airway with the surgeon. This is especially true for operations involved with the laryngeal inlet. Imagine that the diagram below shows the laryngeal inlet, with the vocal cords shown in red (these diagrams are not drawn to scale). There is a growth on one of the vocal cords (yellow) and the surgeon wants to remove it. You happily pass a standard endotracheal tube. However, the surgeon isn’t happy because the endotracheal tube is blocking his access to the growth. Fortunately for this situation, there is a specially designed tube called a microlaryngeal tube. This tube has a small diameter (e.g. internal diameter 5 mm) and this is small enough to provide good surgical access to the growth. Now you might wonder if it is possible to use a paediatric tube with a narrow diameter (e.g. internal diameter of 5 mm) for this purpose. This is not advisable as paediatric tubes are not designed for use in adults. For an example, in an adult patient, the pediatric tube may be not long enough. Also, a paediatric tube used in an adult patient may not have a large enough cuff to provide a good seal. The microlaryngeal tube is specially designed to avoid these problems. Below are two 5 mm internal diameter tubes, the upper one a paediatric tube and the one below it a microlaryngeal tube. Note that, compared with the paediatric tube, the microlaryngeal tube is longer and has a larger cuff. This brings this my explanation of endotracheal tubes to an end. Hopefully you now have a good basic overview of this topic. Of course, when using endotracheal tubes clinically, you must be first formally trained in their safe use. Bye. We have now reached the end of our discussion on tracheal tubes. I hope it has given you a good introduction to the subject and will help you when you read further on this topic. This website is funded mainly by donations, so if you can help, please do consider contributing something small as described below. Also, I don’t have an advertising budget, so please do tell your colleagues near and far about this website ! Many thanks.